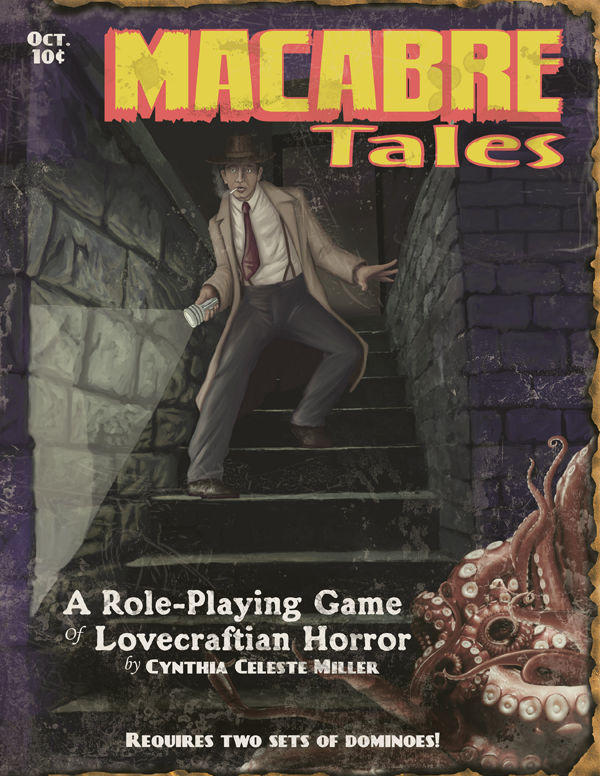 Macabre Tales is the dominoes-based RPG of Lovecraftian horror that strips out the "contributions" of later authors and focuses solely on what Lovecraft himself created. Spectrum Games, known for accurate emulation of various genres in their products, offers a brand new take on role-playing in the terrifying and abhorrent world of Howard Phillips Lovecraft. Will you emerge from the experience unscathed? Or will your mind snap in the wake of all the hidden abominations that lurk in the shadows, just out of sight of humankind? The player maintains a hand of three dominoes that can be spent when the character attempts to perform a difficult task. Each domino could lead to success or doom the character to certain failure, so the player must choose wisely as everything could hinge on the final outcome. This encourages a very deliberate style of play that automatically spawns a great deal of tension at every turn. Macabre Tales leaves no stone unturned... even if there's something eldritch and unknowable slumbering beneath it. Every aspect of H.P. Lovecraft's fiction is accommodated in the game and is handled in a slavishly authentic fashion.